Is it time to address the unconscious patterns behind your weight? Have you been struggling with weight for years, with no end in sight? Are you wanting to lose weight but can’t stop those sugar or carbohydrate cravings? Do you lack motivation to exercise? Are you sick of binge eating or emotional eating? Are you consistently making poor food choices? Our weight loss hypnotherapy service on the Gold Coast can help you to overcome your obstacles to losing weight and start working towards your optimal weight. Have you been struggling with weight for years, with no end in sight? Perhaps you’ve tried every diet and exercise regime under the sun, but just don’t seem to be seeing results because you keep falling back into old destructive or sabotaging behavioural patterns. In Australia, over half of our population are either overweight or obese, and the problem is growing. Due to our busy lifestyles and the daily stresses that we deal with, our health often takes a back seat. Even with the best of intentions, many of us still struggle to maintain our ideal weight. Fad diets and new ‘miracle’ shakes, pills and treatments come and go, and all the while, weight issues remain. Weight loss hypnotherapy could be the answer you’ve been searching for to overcome those walls you keep hitting. Ongoing weight issues are not a result of your inaction, laziness or inability to maintain a weight loss program. You have simply not found the right solution to overcome those destructive unconscious behaviours, that is; to address the underlying issues behind your struggles with weight. You can stop struggling today, and start achieving the results you’ve been dreaming of. Hypnotherapy is a tried and trusted method to help overcome a variety of issues including addiction, phobias, and yes, weight loss. Getting to the core of your problems and addressing your subconscious mind, beliefs and your ingrained habits, weight loss hypnotherapy is designed to address the specific issues causing your weight loss struggles. 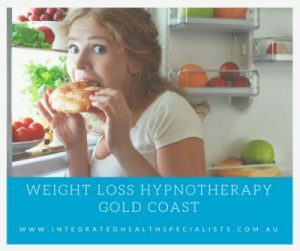 Our Gold Coast weight loss hypnotherapy service can address these specific obstacles, and affect change to your long-held beliefs and habits; finally setting in motion long-term, real solutions to your weight loss battle. Weight loss hypnotherapy works by treating those deeply ingrained habits, which conflict with your conscious desires and goals. If you’ve struggled for years with little to no success, weight loss hypnotherapy may be the solution you’ve been waiting for. At Integrated Health Specialists, our weight loss hypnotherapy service gets to the root of your issues, in a safe and supportive environment. Our dedicated and experienced hypnotherapist will develop a specific program for you, depending upon your individual struggles. 1. Identify the specific undesired behaviour/s or problems that you want to change. At Integrated Health Specialists, our weight loss hypnotherapy service has helped countless people to finally achieve their weight loss goals. CONNECT WITH US TODAY to find out more!